The April release of this colorful and interesting guide to renewable energy and broader environmental concerns coincides with Earth celebrations around the world, the annual international focus on our planet. This timing offers an ideal opportunity for young people to use this book as a source of both information and inspiration. At the same time, middle-grade teachers might well find in it ideas for class projects directed toward cultivating respect for the environment. The book is accurately billed as a collection of 22 exciting and engaging activities and projects addressing renewable energy. The first activity Mr. Caduto presents helps readers to understand the real impact of people’s use of the earth’s resources by challenging them to spend a 24-hour period without the direct or indirect use of fossil fuels. He follows up with another simple project that demonstrates, rather than dictates, what the greenhouse effect is. Some of the activities are astounding but also remarkably simple. For instance, Mr. Caduto outlines how anyone can use the sun’s power to create a wooden nameplate or to power a computer. Such projects achieve a dual purpose: Mr. Caduto encourages readers to care for the environment but also to understand its power. The book goes beyond a presentation of fascinating experiments. The carefully outlined projects are placed in context among explanations of science principles and environmental issues. They are also presented in a way that encourages a sense of both wonder and power in young global citizens. Mr. Caduto subtly but effectively directs the reader to an understanding of what one person, even a child, can achieve when armed with knowledge, inspiration, and determination. The author’s closeness to and belief in his subject is evident. Mr. Caduto begins the book with an anecdote of a 13-year-old boy who, though initially nervous and unsure, finds success in his efforts to preserve a natural habitat. He then reveals that he was that boy. Throughout the book, readers will find similar inspiration in the actions of “Green Giants,” real-life children around the world who have performed remarkable but achievable measures to encourage respect their environment. For example, Mr. Caduto tells the story of a group of children in Manitoba, Canada, who prompted their city council to establish several car-idling-free zones around town. He also introduces a Tennessee boy who, at seven, prompted the creation of a garden for migrating monarch butterflies to replace disappearing natural breeding grounds. 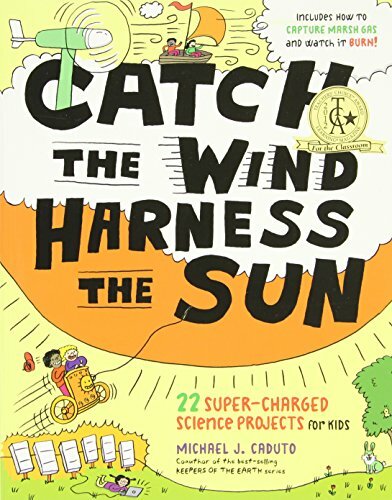 Catch the Wind, Harness the Sun is an informative resource for those interested in the environment, climate change, and renewable energy. The projects and anecdotes offer striking illustrations of the power of our earth and natural resources, and Mr. Caduto presents lessons with passion. Just as importantly, the examples of other young persons’ achievements can give any child inspiration and an appreciation of the potency of individual and community efforts.